ajp thread takes more cpu time? We are facing some issue while doing performance testing for our application. We have 500 different users using 500 different customer names for searching and viewing the details. The problem we are facing is with the AjpProcessor.read(Socket...) taking lot of CPU time. Attached is the javacore/dump if needed. We have the below parameter after going thru various performance link on the community and sites. let us know if we have any more changes or additions to the above table at any level. Any body encountered/faced this issue earlier, please let us know. 1. ajp thread takes more cpu time? ahh!!! finally we shooted the star...but!!!! It seems like the AJP almost maintains persistent connections, which reduces the scalability, Enabling APR(Apache Portable Runtime) with AJP improves its performance as this polls and closes the sockets, uses adv I/O, shared memory and moreover it is native processing. The channel HTTP+AJP also can be considered. 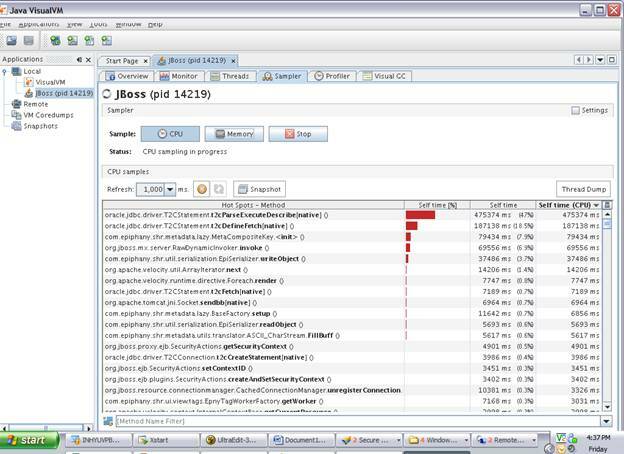 After we enabling APR+AJP, the issue is not seen on the jvisualvm cpu time, but then the cpu still hits to 100% and now showing on Oracle parsing. Note*:There could be bugs around these connectors, try using the latest ones.